I just have to brag on Kate at Sweet Cricket Design for a moment. Yes, the one I have raved on before… like the time she designed Cilla’s shower invitation :). Well, she has done it again!! I contacted Kate a few weeks ago regarding creating a birthday invitation for the boys. For the past two years they have shared a birthday party since their birthdays both fall around Christmas so planning with open weekends and travel tends to be a problem. Anyways, I immediately thought of Kate and Sweet Cricket Design. I love to work with her because she is so creative and also so very easy to work with!! And she delivered!! She gave me exactly what I wanted…I wanted a football theme with a Buckeye twist. And we got exactly that. Big Brother squealed in delight when he saw it. Another thing I love about working with Kate…is that she just emails me the completed file (after receiving my design approval) and then I choose who prints it. I have used Vista Print on a couple of occasions, but I’ve been running behind this year so it was great to just be able to save it to a thumb drive and run to a local store to print the invites. I cannot state enough what a breeze it is to work with Kate!! It is just so easy. Throughout my blogging tenure I have always tried to highlight small business owners of whom I love to support. 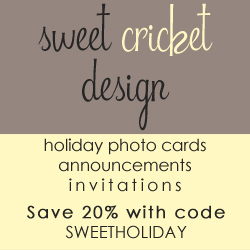 Kate at Sweet Cricket Design is definitely one of those small business owners. I know I will continue to go to her for years to come. Luckily for you all, she is still offering her 20% off coupon to her shop as well. Just enter SWEETHOLIDAY at checkout. She has ridiculously fast turn around time too…so you definitely still have time to order your holiday cards from her. PS…Kate doesn’t know I’m writing this post. I was not promised anything in return for this post. It is simply my personal thoughts :).